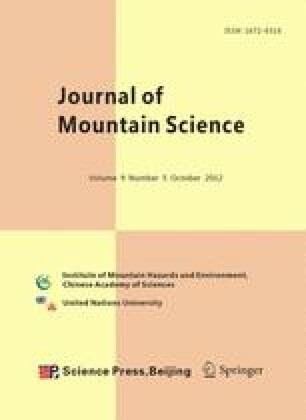 A novel embedded sensor network records changes in key climatic-environmental variables over a range of altitude in the BaekduDaegan Mountain (BDM) of Gangwon Province in Korea, a protected mountain region with unique biodiversity undergoing climate change research. The investigated area is subdivided into three horizontal north-south study areas. Three variables, temperature (T, °C), relative humidity (RH, %), and light intensity (LI, lumens m−2, or lux, lx), have been continuously measured at hourly intervals from June, 2010 to September, 2011 using HOBO H8 devices at 10 fixed study sites. These hourly observations are aggregated to monthly, seasonal and annual mean values, and results are summarized to inaugurate a long-term climate change investigation. A region wide T difference in accordance with altitude, or lapse rate, over the interval is calculated as 0.4°C 100 m−1. T lapse rates change seasonally, with winter lapse rates being greater than those of summer. RH is elevated in summer compared to other seasons. LI within forestland is lower during summer and higher during other seasons. The obtained results could closely relate to the vegetation type and structure and the terrain state since data loggers were located in forestland.